Teenagers throughout history have had two common goals: To make some serious money on their own terms, and to avoid ever having to say, “Your total for the two Happy Meals is $6.44, next window please,” while a shift manager with a bushy mustache and a sweater vest threatens to dock their pay. Teens are limited in their ability to perform the same jobs that adults are qualified for. After all, very few restaurants are willing to hire an executive chef that is still battling acne scars. Add a very limited amount of time available to work, issues with transportation or a driver’s license, and the pitiful pay many employers expect their teenaged employees to subsist on, and finding meaningful employment during the teenaged years can be difficult. Here’s idea one that’s actually MOST suited for teenagers, since nobody wants to see a 40-year-old man doing video fast food reviews (believe me, I’ve tried). With absolutely no startup costs, any teenager with strong opinions can set up a YouTube account, spout a few of-the-moment catchphrases, apply some slick graphics, and bring their ideas about food to the video airwaves. Fast food reviews? Recipe demonstrations? Foodie science experiments? Teenagers can shape a YouTube channel around any of these niches, and if they gain significant popularity, reap the financial benefits of in-video advertising, all of which can be set up directly from within YouTube. One example of a the possibility in action with TheReportOfTheWeek YouTube Channel. This creator has generated an enormous following by simply reviewing fast food restaurant meals from a car: McDonald’s, Taco Bell, and Little Cesar’s have all been reviewed. This is something little any teenager can execute and afford to do. To date, this creator is approaching a million subscribers with videos that have millions of views. While TheReportOfTheWeek doesn’t publish income report, it’s safe to say that the creator makes thousands in revenue per month through ads on the channel. Even if the first foodie channel or cooking channel you create on YouTube doesn’t take off you will at the very least have built a valuable set of skills you can utilize in the future. By creating and owning a YouTube channel you’ll learn basic video editing skills, improve your communication in front of a camera that could be beneficial for all kinds of future ventures. Though as an internet culture, we may have already reached “peak food blog,” there is always room for someone with a unique voice, perspective, or ability to launch a new food blog and bring their opinions and knowledge to the masses. “Teenaged Chef” is a niche all its own, and young people with strong, articulate opinions on food and a technologically-inclined bent can make money in this business thanks to banner advertising and sponsored posts. Teens can hire themselves out as cake decorators in any capacity, both professional and amateur. Many bakeries are looking for help with “finishing” the cakes commissioned by their customers, and can always use even inexperienced help with decorating and icing. This provides teenagers an opportunity to both get paid for doing something they love, as well as develop skills they can apply later in their cooking careers. For anyone with a unique food idea, selling at local farmer’s markets provides a low-barrier-to-entry way for teenagers to start selling their food to the public. With just a small investment for equipment and permitting, teens can sell prepared food like cakes, pies, or even burritos and pizzas at the farmer’s market, while avoiding many of the regulatory hoops of opening a full blown restaurant. Also, since most farmer’s markets operate only a day or two per month or week, teens will have plenty of time to meet their other responsibilities, while not getting overwhelmed by the daily relentlessness of keeping a restaurant going. Be aware that obtaining space at a farmer’s market may require signing up for vendor space well in advance of the upcoming season, and check with your local municipality for what kinds of permits and equipment is required. The internet allows anyone to find an audience for their business idea, and scale it quickly. We love the idea of starting an online food gift basket service, for corporate gifts or special occasions. Teens can source product, assemble the baskets, and provide delivery, as well as perform all of the functions of online marketing and promotion. Mik Bushinski was a sophmore in high when he started his ice cream truck business. This may seem like the most obvious idea, but it also provides the best foundation for anyone serious about entering the food business. Particularly during the summer months, all food businesses need extra, low-cost employees, which provide ample experience for anyone looking to learn how a commercial kitchen works. Teens should expect to start low on the totem pole; dishwashers, prep cooks, and cleaning staff are all common roles for teenagers, though advancement is usually a possibility for anyone who works hard and displays a commitment to their role. Cottage food laws allow teenagers the opportunity to start cooking and selling to the public right from their own home kitchens, with regulations varying from state to state. In general, baked goods are usually okay, as well as some snack foods, pickled items, and any food that isn’t designed to be served hot (or cold). Click here to read more about the cottage food business on Food Truck Empire, and click here to research the regulations in your state. Almost everyone in the food businesses agrees: When it comes to social media marketing, teenagers are often flat out better at it than adults. Kids and young adults have a basic understanding of social media that most adults struggle to copy; consider launching a small online marketing consultancy specifically for bars and restaurants, that can help busy restaurant owners with things like website design, social media marketing, posting daily specials and events, and more. With a very small investment (and a trip to a warehouse club store like Costco), any teenager can put themselves in the “independent candy vendor” business, reselling candy to students between classes and after school. Some schools may have rules prohibiting this, but as any entrepreneur (or teenager) will tell you, sometimes rules have to get bent in the name of launching a successful small business. Home baking in a cottage capacity doesn’t need to be limited to cakes and candies; teenagers with an interest in both cooking AND dogs can easily whip up inexpensive and nutritious dog treats in their home kitchens, and sell them either online or to local pet supply stores. Again, the low startup cost of internet businesses means that anyone (teenaged or otherwise) with a good idea for a niche store can set up shop online and start selling immediately. We also like that this business allows teens to start online shops without actually maintaining any inventory; as long as their suppliers are local, store owners don’t have to actually purchase any product until the first orders start coming in. The curated subscription box model is also super popular right now; teens can dream up their own “whatever-of-the-month” club, and handle the assembly of their boxes and shipping to customers themselves or with the help of a website like CrateJoy. Teenagers who have a collection of favorite recipes can easily create an attractive eCookbook, to sell online either as a standalone product or as a revenue stream for a food blog, as outlined above. Many small towns or cities have more restaurants or cafes, than they do restaurant guides. Using WordPress, anyone can start a hyper-local restaurant guide for their community, and provide reviews from real customers, business information including hours and address, or restaurant photos, specials, and favorite dishes. These types of guides can make money either through banner advertising, or by a paid inclusion program for local restaurants interested in participating, options for most of which is baked into the software. For teenagers with access to their own set of wheels, a small-scale grocery delivery or shopping service can make sense in some communities. Likewise, lunchtime deliveries can be a lucrative way for teenagers to collect tips from large office buildings, or any workplace with a large number of employees who may not have time to run out to get their own lunch. Work with these companies to arrange a weekly or bi-weekly sandwich or lunch service. A $2 tip may not seem like much, but when you collect it from 100 employees? This is a business with revenue that can add up quickly, with just a few key clients. If you’re a teenager reading this (or parent of one), we hope that we’ve been able to stimulate some specific ideas for launching your first low-cost food related business. Remember that the most successful entrepreneurs of today have all taken their lumps and often failed with their first venture into the world of business. Have fun with these low-risk businesses and take comfort in knowing that you’ll learn some extremely valuable lessons along the way even if you don’t operate the venture longterm. If you’re looking for more inspiration, check out this previous podcast with Mik Mart Ice Cream. Mik started his ice-cream business while he was a sophomore in high school. 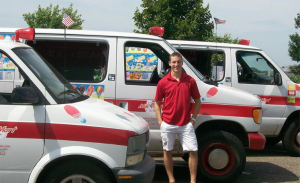 Today, Mik Mart Ice cream has multiple vans operating each summer in the Twin Cities area and his family continues to operate the business to this day.